If your goal is to drive more traffic to your website, you want to be sure that your SEO efforts are paying off. While there are many ways to track traffic, conversions, and the like, tracking your rankings for your focus keywords is a great way to see how your website measures up to the competition. Fortunately, Raven Tools created the SERP Tracker tool to help you track your keyword rankings across search engines, locations, and devices. Plus, you get a side-by-side comparison of how your website ranks against your competitors. You need reliable, accurate data to inform your SEO strategy. Here’s how to use Raven Tools to track your keyword rankings and drive more organic traffic to your website. What is Keyword Ranking in SEO? Why Should I Track My Keyword Rankings? Step By Step Directions To Track your Keyword Rankings with Raven Tools. Keyword Ranking refers to where your website’s position is for a certain keyword in the search results. It is one of the primary KPIs (key performance indicators) for determining the success of your SEO efforts and potential for generating organic traffic. For example, if you are a family lawyer in Los Angeles, you want your website to show up in the Google search results when some searches “los angeles family lawyer”. If you show up as the first search result (Position 1), this is the most coveted spot, as you are likely to receive a high number of clicks to your website. Smart Insights conducted a study that provides a lot of data on this, but suffice it to say – you can expect about 33% of all clicks for a keyword if you are in rank position 1. Your goal is to get as many clicks and web traffic as possible for keywords that are relevant to your business. If however, you are not on page 1 at all, then the Ricky Bobby quote applies, “if you ain’t first your last!” (perhaps the only real application of this quote). Keyword tracking is the practice of tracking how your website ranks for your focus keywords. This information will help you in knowing what optimizations need to be made to your website. Keyword rankings used to be the primary metric for assessing the success of one’s SEO efforts. Today, that’s not necessarily the case. While keyword rankings are important, we always recommend tracking a variety of KPIs (key performance indicators) – including traffic, click-through rate, conversion rate, and the like. The reason being, your main goal is rarely just getting to position 1 in the SERPs. It’s likely that you want more traffic and sales. Don’t get us wrong, we love keyword tracking. BUT – tracking keywords and watching the little green arrow doesn’t get you money. Converting visitors gets you money. Though your keyword ranking will help determine how much organic traffic you get to your website, that just doesn’t paint the whole picture. You must first do keyword research to be sure that the keywords you are targeting actually make sense for your website and audience. A rule of thumb for me is to target KWs that have high buying intent with around 50+ monthly volume, target 5oo+ monthly volume KWs with soft buying intent, or target KWs that are niche relevant with no explicit buying intent starting around 1.5k a month volume. Then, the amount of traffic you get is influenced by both the position of your website in the search results, the search volume of the keyword, and your click-through rate. The lesson here is that keyword rankings do matter, they just should not be the sole focus of your SEO strategy. It’s worth tracking your keyword rankings to confirm that your presence in search engines is improving over time. The value of getting to position 1, or even the first page of the search results, is significant. This is one of the best indicators of how much traffic your website is able to get. Tracking your keywords is an easy way to see how your website is measuring up to your competitors. With the SERP Tracker from Raven Tools, you are able to compare your position with those of all of your competitors for a variety of keywords, devices, and locations. Including keyword tracking in your analytics also allows you to diversify your SEO approach. You can see content areas that need improvement, find keywords that you probably should be ranking for, and keep an eye on your competition. The result is a data-focused, well-rounded SEO strategy that’s focused on getting your website more organic traffic. The Raven Tools SERP Tracker allows you to track all of your keywords in one place. Every monthly plan includes 1200 rank position checks, plus the option to track keywords on a per-keyword basis for an added price. This gives you ultimate flexibility without having to upgrade to a new plan. Not only can you see how you are ranking for your focus keywords, but you can set custom parameters across devices, locations, and search engines. Finally, you can compare your website rankings to your competitors to help inform how you need to improve your own SEO strategy. 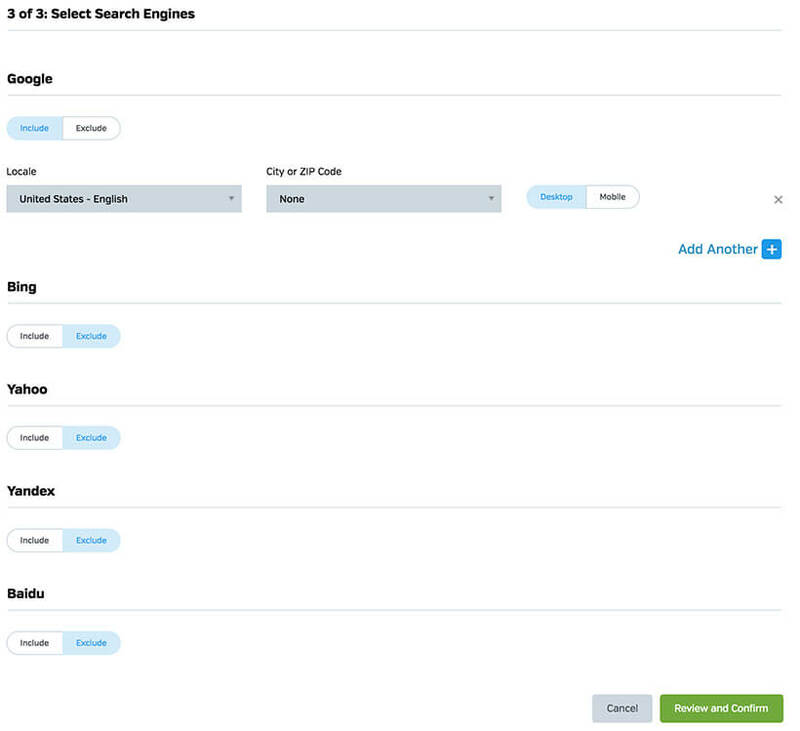 In the SERP Tracker tool, you can set unique parameters to customize your keyword tracking strategy. This gives you the flexibility to track all of your keywords across search engines, devices, and locations. Log into your Raven Tools account and enter the campaign of your choice. Then, go to the Rank Tracking tab in the left side menu and select the “SERP Tracker” tool. Before setting up keyword tracking, you will see a variety of features on your dashboard. The Rank Position Check Usage indicates how many rank checks you have used (out of 1200) for the month. You will also see the option to set the date range for your keyword ranking check. Finally, the Tool Options tab allows you to either export data or check your current position check usage in more detail. To start tracking your ranking for your focus keywords, select “Add Keywords”. By this point, you should already have a list of keywords in mind. If you have not yet done this, you can use the Raven Tools Keyword Research tool to generate a list of keywords worth targeting for your website. After you select “Add Keywords”, you will see a pop-up that prompts you to add your keywords. Next, add the keywords that you want to track. You will see a field that allows you to add up to 1000 keywords at one time. If you are entering multiple keywords at once, enter one keyword per line or separate each keyword with a comma. The second field asks you to choose the Rank Tracking Frequency. This is how often you want the SERP Tracker to conduct keyword rank checks. You have the option of selecting Daily, Weekly, or Monthly rank checks. Note that the first check will be made immediately. The next one will be made at your selected interval. You can then select which search engines you want to be included in your keyword ranking checks. Simple toggle Include/Exclude for each search engine. For each search engine that you want to include, you will be prompted with more options. If you have opted to Include a search engine in your keyword ranking checks, you will then be asked to set parameters for the location and type of device. You can check keywords for as many locations/zipcodes as you like. Then, choose whether you want to track the keywords on Mobile or Desktop devices. Note that each parameter counts as 1 position check and will be added to your Rank Position Check Usage total. Once you are ready to confirm, click “Review and Confirm”. A pop-up will then summarize your selection and confirm that you want to add these keyword ranking checks to your campaign. Within 24 hours, you will be provided with the at-a-glance metrics you need to effectively track your keywords. 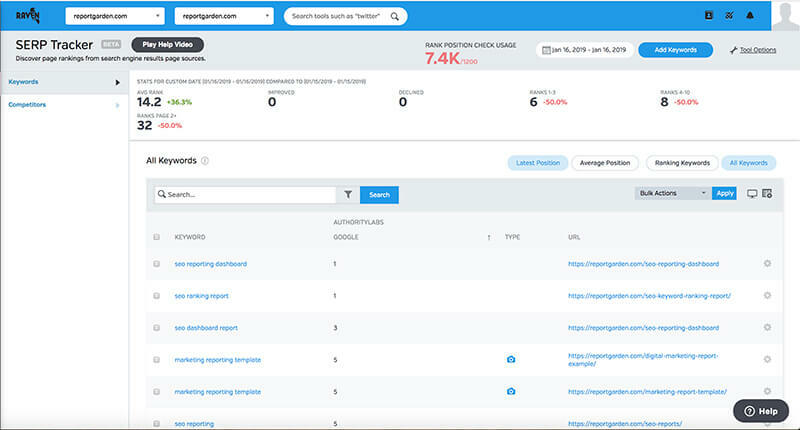 You will be shown all of the data from your keyword ranking checks on your dashboard. Here, you can toggle your view to Latest Position, Average Position, as well as only the Ranking Keywords or All Keywords you are tracking. Any keywords that did NOT have a ranking will have an N/A in that column. At the top of the screen, you will also see a summary of all keyword data and how it compares to the previous date range. Review the results of your keyword ranking check to see which keywords your website is ranking for at which position. This will show you what keywords you may need to further optimize your website for. You also want to see how your website compares to the competition. You can get a side-by-side comparison but using the Competitors rank check option. Click on “Competitors” in the left side menu. Then, you can add a competitor that already exists in your campaign or create a new one. Once selected, their keyword rankings will be displayed next to yours so that you can easily compare data. You can also compare by search engine type. This is the best way to see how your website measures up and which pages on your own site need further optimization. In Rank Tracking tab you will also see options for Google Search Analytics and Bing Webmaster Tools. Here, you can connect your Raven Tools account to your Google Search Console and Bing Webmaster Tools accounts. This allows you to see exactly how your website is performing in the search results. With more data available to you, you can better create an SEO strategy that serves to improve your keyword rankings and drive more organic traffic to your website. Check out our article on how SERP tracker is different from GA, GSC, or Bing Tools for a more detailed comparison between each tool. I’ve written a post on how to track keywords in the modern era of Google for those more interested in a general keyword tracking strategy. Give that a read after you’ve finished here if you feel inclined. Your SEO success depends on staying on top of the data. Use Raven Tools’ rank tracker and combine that with your Search Console and Google Analytics data to get a full picture of where your site stands on the SERPs.